Nous cuisinons pour des évènements petits et grands, nous pouvons aussi vous livrer ou cuisiner sur place chez vous, dans votre villa ou sur une plage. A chef at home … I will come to your venue and cook a fresh, gourmet feast for your wedding, birthday, hens party or movie production. We cater to events large and small, and can cook and/or deliver your event indoors, outdoors by the beach, or in your villa. Laurence, visionary and head chef at Lilikoi Garden Café, one of Moore's local treasures. She and her crew did ALL the catering for our (100 person!) 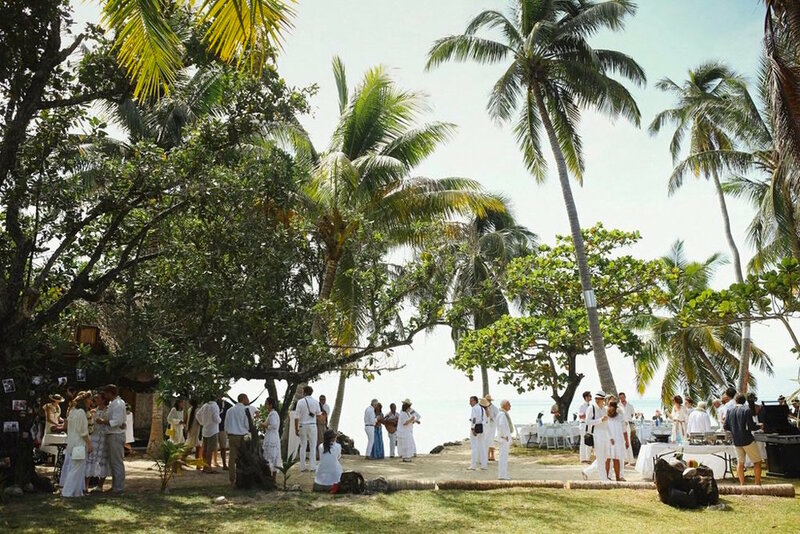 wedding on Moorea, including both a welcoming dinner and an amazing tasting menu brunch on a remote property location. Laurence approached the whole thing with so much grace and humor, not a note of hesitance, despite the notable challenge. We couldn't have been more touched to share this special time with her. Guests were all blown away by the delicious cuisine--original chocolate cake and home made coconut ice cream, unforgettable shrimp salad, a number of unique poisson cru (passion fruit poisson cru highly recommended! Get it! ), Laurence's grandmother's duck confit recipe, and more... Lilikoi Café is the creation of a true artist. There are many hotels on Moorea that miss out on the opportunity to serve more locally influenced Tahitian-French fusions. We highly recommend taking a trip to Lilikoi Garden Café for a true local experience. Having a wedding? Well, you know who to call ;) Coconut Traiteur Tropical Gourmet!! Coconut Traiteur Tropical Gourmet your catering service on Moorea.